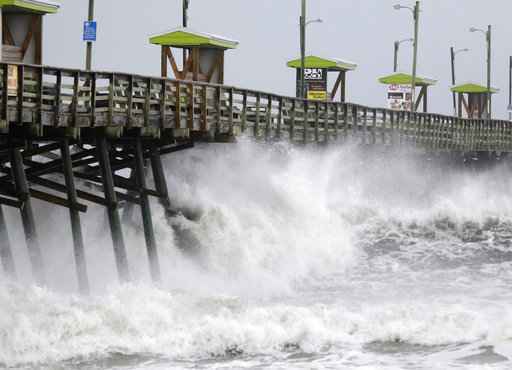 MIAMI (AP) - Hurricane Florence has begun to batter the Carolina coast, and she's not going away anytime soon. Outer bands from the hurricane are now lashing land , at least a full day before the National Hurricane Center expects the slow-moving storm's eye to blow ashore around the North Carolina-South Carolina line. Officials say people refusing to evacuate could end up alone, drenched and in the dark, as rescue crews won't go out to help in winds above 50 mph (80 kph). -Size: Hurricane-force winds extend up to 80 miles (130 kilometers) from the center, and tropical storm-force winds extend up to 195 miles (315 kilometers). Overall, Florence is about 400 miles (644 kilometers) wide.